Guest Suite, a 4YO gelded son of Quality Road trained by Neil Howard for the ownership team of W.S. Farish and Lora Jean Kilroy, looks to have returned to some semblance of his former stellar self. In the last three starts, he has a win in allowance company at the Fair Grounds; a third in the G3 Ben Ali Stakes at Keeneland behind Rated R Superstar and Chip Leader; and a second in an allowance at Churchill Downs on May 20. Before those three, he had not been better than fifth in the previous four outings. And, that is coming after a victory in the LeComte Stakes at the Fair Grounds in 2017, when it appeared for a few minutes that he may be on that Triple Crown trail. The colt worked this morning at Churchill Downs, going 5 furlongs in 1:01.40. That was the second best time out of 9 to go the distance. Talent Scout, a 3YO colt by New Year’s Day and trained by Bob Baffert, looked impressive in breaking his maiden at first ask last October at Santa Anita. The problem is that the colt has not been seen in the afternoon since that inaugural run. He got his 9th published work since April this morning when he went 3 furlongs in :37.40. 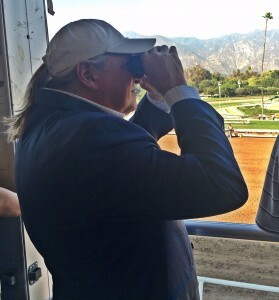 That was the 6th best time out of 11 to go at Santa Anita. It will be interesting to see when this guy, owned by Gary and Mary West, will face the starting gate for real next. Ike, a 3YO colt by Paynter and another that hails from the barn of Team Baffert, worked this morning a Santa Anita, as well. He went 6 furlongs in 1:12.20, which was the fastest of two to work that distance early today on the West Coast. After breaking his maiden at Santa Anita in February, this guy ran a tough second in the Northern Spur Stakes at Oaklawn Park in just his third race ever. He was beaten a little more than two lengths by High North, a Midnight Lute colt trained by Brad Cox. Since that race, this one has been spotty in his morning efforts. He worked on April 25, but was off for about a month. Now, he has had three regular works in a row, and all of them have been super impressive. Watch for this one, owned by Westrock Stables LLC. He has talent.